Former New York City mayor Rudy Giuliani’s Republican candidacy for the 2008 Presidential Election began in October 2005 when the “Draft Rudy Giuliani for President, Inc” was formed. The committee filed papers with the Federal Elections Commission (FEC) on November 22, 2006. On February 5, 2007, Giuliani officially entered the 2008 U.S. presidential election by filing a "statement of candidacy" with the FEC. If elected he would have become the first Italian American president of the United States. His campaign went well and he became the front-runner. But he lost momentum after the early-state primaries. His campaign ended when Giuliani lost the Florida primary to John McCain, whom he endorsed after he withdrew. Rudy Giuliani's name had been mentioned as a possible candidate for President since 2004. In November 2006 Giuliani announced the formation of an exploratory committee. In February 2007 he filed a "statement of candidacy" and confirmed on the television program Larry King Live that he was indeed running. Giuliani emerged as the front runner, ahead of first-tier candidates such as John McCain and Mitt Romney, and remained ahead of the Republican pack until December 2007, when he began to fall behind other candidates. According to the Federal Elections Commission, Giuliani raised $18,029,974 in the first quarter, second to Mitt Romney among Republicans and fourth overall. Out of that money he has spent only $6,080,239. Of that money he raised the second-most from Wall Street of all presidential candidates, with $1.8 million raised. As a centrist Republican, Rudy Giuliani chose to avoid early state primaries and caucuses (Iowa, New Hampshire and South Carolina), except for the state of Florida, where he hoped to have a lot of supporters. His plan was to win in Florida and later in delegate-rich states such as California, New York and New Jersey. He failed to win in Florida and the day after his defeat he withdrew from the race. I mean, this is divorce on steroids. To publicly humiliate your wife in that way, and your children. That's rough. I think that's going to be an awfully hard sell, even if he weren't pro-choice and pro-gun control. 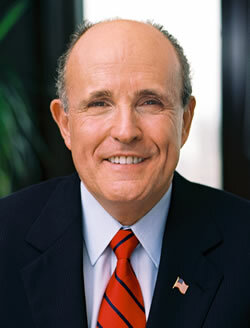 By March 2007, The New York Times and the New York Daily News reported that Rudy Giuliani had become estranged from both his son Andrew (now a golf team member at Duke University) and his daughter Caroline (graduated from Trinity School in 2007, attending Harvard University), missing major events in their lives, such as graduations, and sometimes going long stretches without talking to them, and that neither of them was taking part in his presidential campaign. Caroline apparently linked her personal Facebook page to the campaign of leftist Democratic presidential candidate, Senator Barack Obama. However, the link has since been removed. Giuliani expressed pro-choice positions during election years when he was running for mayor of New York City, 1989 and 1993, and when he was running for a New York State seat in the United States Senate in 2000. 1989: Giuliani said, “There must be public funding for abortion for poor women. We cannot deny any woman the right to make her own decision about abortion because she lacks resources." 2000: During his competition with Hillary Clinton for a New York State seat in the United States Senate, he said that he supported then president Bill Clinton’s veto of a law that banned partial birth abortion: “I would vote to preserve the option for women.” Although now Giuliani says he supports some restrictions on late-term abortions. Giuliani and his second wife, Donna Hanover, gave money to Planned Parenthood at least six times during the 1990s. Because of his stance on the abortion issue, he has faced criticisms from Christian conservative leaders. James Dobson, an influential Christian conservative leader, wrote that he could not fathom Giuliani's stance on the abortion issue and he would not vote for him if he were the Republican presidential nominee. According to a recent poll, twenty-seven percent of Republicans would vote for a pro-life third party candidate of Mayor Giuliani. This page was last modified on 18 August 2016, at 10:43.